0 Comment August 19, 2017 Like? Meet the engineer behind the PTZOptics iOS Camera Control App! Justin Brown is the talented iOS app developer behind the PTZOptics iPhone and iPad application for pan, tilt and zoom controls. In this live show, we demonstrate the iPhone and the iPad apps live to control the cameras in our studio and even outdoors using an outside IP address. Stay tuned for the post show where we discuss how to control cameras from anywhere in the world using a simple smartphone app. Brown shows us how to save PTZ camera presets in the iPhone/iPad app with the ability to save a title on each preset. The app interface is split up into manual joystick controls, zoom/focus and presets. There are ten camera preset buttons on the touchscreen remote control pad if you include the home button. Brown also shares with us the ideal pan, tilt and zoom speeds that he suggests for using PTZOptics cameras with his wireless iOS control application. One of the other interesting features in the iOS PTZ camera control app is the ability to assign more than 10 cameras PTZ presets using the same IP address. So the way the app has been built you can add the same camera to app multiple times and have different camera positions stored in each folder. This allows users to have more than 10 presets that are all names and hop over to another tab with 10 more named PTZ presets. As you can see with the picture above each additional PTZ camera will have its own tab in the iOS app. This allows users on an iPhone or iPad touch screen to simply touch the camera tab that they would like to control. Since this is all done over the LAN or VPN (WAN) everything is wireless and easily managed. Do you want to be in total control of your live streaming workflow with ease? 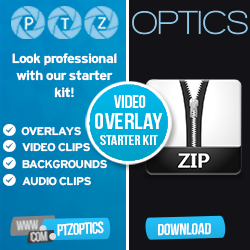 PanTiltZoom gives you that full functionality to control your multiple PTZOptics cameras from any location. With its easy setup and your device’s access to the internet, you can now control your PTZOptics cameras from your iPhone, iPad, or iPod touch using VISCA Over IP protocol. PanTiltZoom simultaneously controls up to four cameras (with 10 different settings for each camera), with a multi-touch interface. With its variable touch control speed, you can easily pan, tilt and zoom, and as well as a transition back and forth between saved preset positions. PanTiltZoom allows up to 10 preset positions for each camera – that is to say, you can store up to 40 preset positions in PanTiltZoom, which is awesome. One interesting thing about PanTiltZoom is that the presets are app-specific, such that you can easily switch between the different cameras without overwriting the presets stored in the cameras. As long as your device has VPN capabilities and outbound access to the internet, PanTiltZoom allows you to remotely turn in from off-sites to control different cameras. This simply means that one can easily and simultaneously control presentations at different locations, as long as your device has VPN capabilities and outbound access to the internet, and your PTZOptics cameras are available. Who Can Use PanTiltZoom / Where Can PanTiltZoom Be Used? Due to full featured nature of PanTiltZoom, it can be used almost anywhere. Especially where the budget is limited, PanTiltZoom is the best option for everyone. Its utility ranges from home to office, and even to event centers; from live streaming to security operations. Office Use: Though the use of PanTiltZoom may be limited in a large office, but with multi devices, it can also play a wonderful security role in offices. Event Centers: PanTiltZoom has proven to be a much better tool for covering events such as church services, conferences, seminars, etc. With its features and price, PanTiltZoom has proven to be the best buy for anyone with a limited budget. Before you can be able to use PanTiltZoom, you need three basic things; the IP address of your PTZOptics cameras, VISCA Over IP port and access to the same network as your cameras. The VISCA Over IP is what PanTiltZoom uses to control your cameras, and the port is set to 5678 by default. By using the manual controls, set the Pan, Tilt and Zoom positions you want to use. Press the ‘Set’ button, and then the button you want to save it with. Press ‘Save’ to save your preset position. Repeat three steps above for the remaining 9 presets, and for all the cameras (To switch to different cameras, press the button of the camera you want. The status of the camera will turn green). PanTiltZoom only works on iOS devices and can be downloaded on the AppStore. smartAV Turkey how many multiple users controlling simulataneously? smartAV Turkey does presets limited to 9 as remote? smartAV Turkey can you set combined presets for multiple cameras? Purple Griffin Entertainment Does the app connect via bluetooth or wifi from the phone? smartAV Turkey name of the app? cost of the app to the user? Richard Martin that app is really good. Eastern Shore Broadcasting Just showed up. This is so cool! Eastern Shore Broadcasting Well done, Justin! Shaun Houseman does it do port knocking so you don’t have to do port forwarding or make it a DMZ connection? smartAV Turkey forgive my illiteracy, i am new to app world. can you put a password to open the app? Eastern Shore Broadcasting Will this work with any VISCA controlled cam? Eastern Shore Broadcasting iOS only at this time? smartAV Turkey justin how can we get in touch with you for customization ideas?